The area comprises the ancient ecclesiastical parishes of Melling and Tatham in Lonsdale. Whilst the latter coincided with the township of Tatham (the civil administrative unit – now civil parishes), the former consisted of seven townships: Melling with Wrayton, Arkholme with Cawood, Hornby, Farleton, Roeburndale, Wray with Botton, and Wennington. These eight adjacent townships also shared a common element in their history, having been a core component of the historic Hornby Castle Estate. 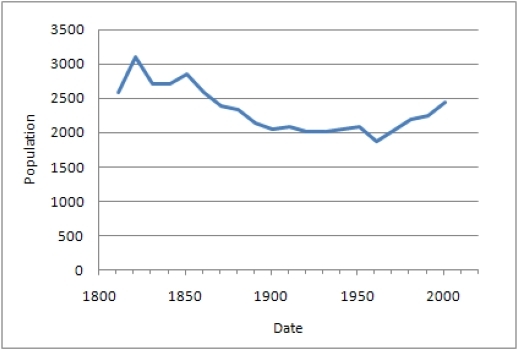 Here, as elsewhere in rural and semi-rural areas in England, the ten-yearly censuses for 1801-2001 reveal dramatic changes in population: an initial rise to a peak in 1821 followed by a long decline, and a final gradual rise to the present (fig. 1). There were variations on these trends in the individual townships, but the overall behaviour was dominated by that of the two numerically largest, Tatham and Wray with Botton. The reasons for these population changes are discussed in the companion article on the website. There were also domestic and economic changes associated with those of population in complex ways, being both a consequence and a cause of them, although fundamentally the former. The census data from 1851-1901 are particularly informative about the occupations of individuals and these can be used to describe the economic effects. The numbers of inhabited houses reflect the changes in population with many townships showing some decline from early peaks, which are smaller than the losses in population, and which reach minima at various times (fig. 2). Thus Tatham and Wray experience 25-30 % losses by the early 1900s whilst Roeburndale losses reached 58% by 1971. In contrast, at Melling, Arkholme and Hornby house numbers are more stable over this period (after an initial peak for Hornby). Redundant houses could remain empty and semi-derelict for long periods before renovation or complete dereliction and/or clearance. Examples of the last option are four cottages on Wray Wood Moor, Roeburndale; cottages at Lowgill and Balshaw farm, Tatham; railway crossing cottages at Tatham and Wray etc. Others were converted to farm use (Higher Craggs farm, Tatham) or were incorporated into another house (e.g. Farr House farm, Lowgill, Tatham). There is also some evidence of the peak in the demand for housing in the early 1800s, with a farm building at Lowgill (Peat House) being converted to a dwelling by addition of fireplaces and flues in the gable walls on 2 floors, to be later returned to farm use. A more unusual example of flexible building use is the conversion of the redundant colliery beam engine house (Clintsfield, Tatham) into a house, briefly occupied around 1861 before becoming derelict. Most townships show slight increases in house numbers in the early 1900s culminating in the sharp rise to 2001, in response to the population changes. This was most marked at Hornby where considerable new building has taken place as a consequence of local planning policy. Elsewhere, there has been limited new-build but considerable conversion of farm buildings released by farm amalgamation or development. Since nearly all houses were in single family occupation, changes in the number of households reflect those of houses. Where reductions occurred, it would be due to migration of families as a result of sudden employment changes, such as Wray silk mill closure, or to migration of young adults before marriage so reducing the future demand for houses. More generally, the density of house occupation fell in all townships after the mid 1800s, on average from 5-6 persons per household to 2-3 in 2001. Interestingly, the farms of Roeburndale had higher densities, 6-7 falling to 3-4 (fig. 3). This decline would be due to a number of factors: reduction in number of servants, migration of family members and deliberate birth limitation. Significantly, (excluding Arkholme) the average number of children of non-working age (less than 15 y) fell between 1851 and 1901 from 2.5 to 1.4 per household, and the numerically smaller number of servants from 0.8 to 0.4. The typical composition of households, in terms of their members' gender, age, and whether family or servant, can be worked out from the census data, e.g. as percentages for all households or for the average household (the same figures). 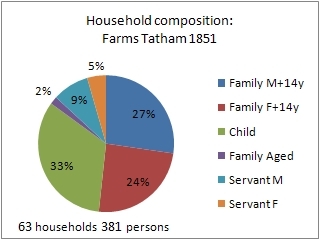 The case of the agricultural sector in 1851 is shown for Tatham (fig. 4). The majority of the agricultural population lived on the farm (91 %), with just half of it being the full-time labour force made up of family members, i.e. males and females from 15 year old children to retirement age adults, with only a small addition (14 %) provided by servants. Although not yet legally required, younger children were usually at school from 5–14 y, i.e. scholars in the census returns. Adult offspring, usually unmarried, were often present, as were siblings of the household head, especially when a widower or widow. Translated to an average household these mean: 6 persons including about 1.5 family males over 14; 1.5 family females over 14; 2 children; and a servant. However, these figures hide a wide variation between households; a few farms had 4-5 domestic and field live-in servants, and 5-6 children were not uncommon. The household composition for the trades populace in 1851, e.g. Wray, was very similar except for a small number of lodgers. However, for silk workers, a significant difference was that half the family females over 14 y were employed as silk workers, as were children as young as 11 y (in all 10 between 11 and 13 y), which was still legal for a long time to come (note different colour code). The households of the few large landlords (landed proprietors) in the area have a totally different composition, comprised of persons entirely supported by independent means and including a large number of live-in servants (see below), e.g. 55% in Hornby Hall & Hornby Castle in 1851. The census records show that there was a wide variety of occupations that provided an income for the people of the parishes, labelled on the early census forms as Rank, Profession, Occupation. However, the information does not always identify, or distinguish between, those directly contributing to income earning and those secondarily supporting it by domestic work, whether family members or servants. This is particularly bad in the case of agriculture where, except for the farmer, no occupation is given for family males above schooling age, taken here as 15 or over (i.e. +14 y), although they will be working full time in the family enterprise. This is less of a problem for trades which traditionally had a hierarchical structure when assistants to the master are identified as apprentice or journeyman, whether family or not. For this reason, it is informative to consider how the population as a whole was economically supported, in terms of major categories of income source. Thus, figs. 5 & 6 show the percentages of the population dependent on particular sources of income, i.e. all family members, adults and children (except those with different paid work) and servants. (Note that Arkholme is not included in this analysis). For the combined townships in 1851, agriculture is the most important source of income but, perhaps surprisingly, for only half the population on average. Of course, this varies widely between townships, depending on their urban populations, from nearly everyone in Roeburndale (81 %) to a quarter in Hornby (26 %). This category includes households headed by farmers, agricultural labourers and (farm) bailiffs (employees of Wennington Hall Estate). In contrast, utilisation of the managed woodlands of the area was only a minor source of income, being greatest at Wray with 6 %. Trades were the second most important source of income in 1851, averaging about a quarter of the population but varying, in opposition to agriculture, from 34 % in Hornby to 4 % in Roeburndale. They included a wide variety of trades engaged in by self-employed individuals or small groups of skilled craft workers, mainly men, who supplied local and external markets. Some also involved a small number of employees, usually as apprentices and sometimes journeymen, e.g. a master shoemaker in Wray in 1841 with 2 apprentices and a journeyman. In some cases these were living as lodgers in the master's house, in other cases they were sons of the family. Included in the list of trades were: (willow) basket making (Melling); blacksmith; footware making (or cordwainer): boot, shoes & clogs; wood working: cartwright, cooper (Tatham), wheelwright, carpenter, joiner, sawyer and bobbin maker (last at Tatham & Wray); felt hat making (Wray also 4 in 1824 & 1 in Hornby1 ); maltster & brewer (Melling, Hornby & Tatham); miller (Wennington & Botton); nail making (Wray also 2 in 18241); rope spinning (Hornby 1841); saddler (Hornby 1841); stone mason; tailor; weaver. Dress making and seamstress were female crafts, particularly concentrated in Hornby (9 persons), typically engaged in by elderly spinsters and young unmarried daughters. Other, unskilled self-employed occupations are also included here: general labourer, laundress, charwoman. Although a few of these enterprises involved more than 10 workers in a township, notably hat and footware making, there was only one organised as a factory, and so considered separately here, i.e. the silk mill at Wray, which supported 11 % of its population in 1851. The original water powered mill had been put to a variety of uses before becoming a flourishing steam powered mill processing silk waste by the 1830s.2 Many of these people and their dependants had migrated to the area, e.g. in 1851 half the silk workers had been born outside this and neighbouring parishes. Next in importance as an income source was the category labelled Independent, comprising mainly those who lived from rents or profits from industry, described by income source, status or honorary position (landed/house proprietor, gentleman/woman, magistrate, JP, sheriff), and the local people they directly employed. They included live-in female and male servants, which could comprise the full Victorian household of butler, footman, housekeeper, cook, maids (lady’s, serving, kitchen, scullery), pot boy etc. The largest households were those of Hornby Castle, Wennington and Melling Halls and Hornby House. In addition, it also includes those who were likely to be employees but who formed their own household, doubtless in tied properties, such as coachman, groom, butler, gamekeeper, gardener etc. It is notable that a significant proportion of the staff are from other regions of the country, including Scotland. At the other end of the scale in this category are those retired persons living on own means or annuities (annuitants), who at most had one servant. Overall, this category averaged 7% of the population, rising to a quarter of the people of Melling and Wennington, somewhat less in Hornby and only a few retired people in Tatham and Roeburndale. Extractive industries, initially coal mining and stone quarrying, were limited by the availability of resources, which were largely under the control of Hornby Castle Estate in the early years. The main quarry still working in 1851 was at Backsbottom, Roeburndale where the Cocklett Scar Sandstone was quarried for building stone, roofing and other flags,3 with income from this source supporting 50 persons in Wray. Coal was mined in the four local coalfields of Smear Hall & Stauvin, Tatham, Clintsfield and part of Bentham.4, 5, 6 Mining had also been active at Farleton until the 1840s.4 In 1851, 16 miners were supporting a total of 43 people, mainly in Wray, which was a considerable reduction from the 1841 census when there were 44 miners supporting 104 persons living in Wray, Tatham and Roeburndale. In 1851, Commerce comprised only a small number of enterprises providing an income for an average 5 % of the population. Inns or licensed victuallers were present in all townships except Roeburndale (Horse & Groom, Melling; Royal Oak, Malt Shovel & Castle in Hornby; Crown & Thistle, New and George & Dragon in Wray; Bridge End and (pre-1851) Rose & Crown, Tatham; Punch Bowl, Wennington15). Shops were few, e.g. butcher and baker in Melling; butcher and two grocers in Hornby (one also a brewer) and four grocers (one also a draper) and two butchers in Wray. Their concentration in these villages suggest that their custom was mainly from the non-agricultural population, whereas the farming communities were either self-sufficient or provisioned by occasional markets. However, there were also itinerant salesmen: a licensed hawker in Hornby and a pedlar in Wray. In addition there were commercial agents and dealers: cattle and tea dealers in Wennington, and a wine and spirit merchant and a coal agent in Tatham. Transport included road and railway workers. Initially only a few, their numbers rose in both parishes as traffic increased on the roads and on the local North Western, later Midland railway, which gradually opened from 1849 to 1850.7 Numbers were inflated in 1851 by labourers still constructing the railway line. Carriers represent the horse-drawn component of the transport system which was important throughout this period (carters who were mainly associated with specific industries, especially farming, are included in those). Professionals mainly consisted of those with a specialist education such as members of the Anglican and Catholic clergies, school masters and mistresses (including less trained assistants), surgeon, veterinary surgeon, barrister and bridge surveyor. It also includes semi-professionals and public servants such as land agents, auctioneer, sub-postmaster and policeman. Paupers were a special case, living on charity dispensed by the Parish Vestry, from the poor rate levied on the local populace. In 1851, there were 12 persons distributed amongst all townships. By 1901, the most significant change was the drop by a third in the number of persons in the two parishes. This was accompanied by a reduction in the contribution to income support of the trades and silk manufacture categories by about 60 %. Consequently, the role of agriculture increased relatively, averaging 54 %, despite a small reduction in the number of farmers. In the townships, its importance varied from 95 % in Roeburndale and 75 % in Tatham down to 26 % in Hornby. Trades had remained an important income source from 1841-1861 but in many townships had declined significantly by 1901. Several of the small industries had disappeared between 1871 and 1881, e.g. basket making at Melling; felt hat and nail making at Wray; corn milling at Botton and Wennington. Others such as weaving and saddle making had only been present in the 1841 census. Although many trades persisted, it was with smaller numbers of people engaged in them, e.g. for footware making (clogs, boots, shoes), the number of male workers over 14 y of age in all townships fell from 27 in 1851 to 6 in 1901. A similar pattern was shown by the numbers of blacksmiths and wood workers. An exception to this was bobbin making and wood turning, with ten workers in 1901, located at the bobbin mill at Millhouses, Tatham, and the old silk mill at Wray after 1898.2, 8 There was also the new trade of oak swill basket making, with one worker in Hornby (1861) and four at Wray (1901). In contrast, a group of trades involved in house construction and decoration showed the variable effects of inputs of external capital by large landowners. Building work for them resulted in significant but temporary increases in numbers in trades such as stonemason, joiner, carpenter, plasterer, slater, plumber, glazier, and painter. However, these were mainly brought in from elsewhere, being boarded or lodged in Hornby and Melling. There they were probably involved in the reconstruction work on Hornby Castle by William Foster in 1881 & 1891, and on the renovation of Melling Hall when it was purchased by William Rome of Liverpool in 1871 (when it is probably represented in the census as one of the uninhabited buildings). The important silk manufacturing industry of Wray had also ended by 1901, after a turbulent history, which was reflected in the gross population history of the township. After a peak employment number of 79 in 1861, the mill was on the market in 1869 and in 1871 only 9 silk workers were recorded, including the mill manager and his wife. It was again briefly very active in 1881 with 74 silk workers living in Wray and 5 more in Millhouses. The mill may have been working on a very small scale in 1891, when there were 13 silk workers, two of whom were said to be unemployed, but in 1898 the mill closed finally.5, 8 In 1901, four silk workers, who were members of the families of the railway workers living in the two Railway Crossing Cottages, Tatham, probably worked at the nearby Low Bentham Mill in Yorkshire, which was then producing silk.9,10 This was probably also the case for a family member at Raby Lodge, Tatham, who was a silk spinner overlooker. The overall decline of trades in this period is typical of the larger region, for which descriptions and histories of several of them have been published elsewhere.5, 9, 11 In general, this pattern is seen as being due to competition with larger industrial producers elsewhere in northern England, facilitated by the railways. The other secondary income sources had all increased their contributions relatively. Most marked was the Independent income category, averaging 10 % but rising to 33 % for Melling and 22 % for Hornby. Commerce remained a minor source, mainly concentrated in Melling, Wray and Hornby, with the variety of enterprises much as before although the number had increased. Inns were still present in most townships, although with some changes: the Malt Shovel had closed in Hornby; Melling had lost the Horse and Groom after 1851, to be temporarily ‘replaced’ by the teetotal Shakespeare in 1881, and the Rose and Crown, Tatham, temporarily closed in 1851 because of a change in ownership, had reopened by 1861. The Punch Bowl in Wennington had also closed after 1861 to be replaced by the Foster’s Arms by 1881. Transport had become more important. More attention was being paid to the highways, employing more road labourers and presumably financed differently as the toll gate at Farleton had closed after 1861. Also, the local Midland Railway network had expanded, with the opening of the link between Wennington and Carnforth in 1867 and the number of railway employees had increased, i.e. station masters, porters, signalmen and track maintenance workers (platelayers), living especially at Hornby and Melling. Extractive industries were locally still a minor but significant income source in 1901, mainly consisting of quarrying with 18 quarrymen and flag dressers in Wray, all probably working at Backsbottom Quarry, Roeburndale, and a few more at Hornby (probably Hornby Park Quarry in the Ward’s Stone Sandstone). 3, 5, 12 However, coal mining had declined considerably with the number of miners falling to four in 1881, five in 1881 and one in 1891, when mining was restricted to a small operation at the northern edge of the Smear Hall Colliery, near Birks. These were the final days of the industry, which had existed in the area since at least 1565.4 As with quarrying, these miners lived in Wray. However, a new extractive industry was brick making, with a quarry working the Caton Shales and a nearby brickworks opening in 1874 in the neighbouring township of Claughton,11 with a workforce that included four labourers living in Wray and Hornby. In 1901, the Professional category was generally similar in number and broad composition to that of 1851, principally comprising teachers and members of the clergy. Others included civil engineer and medical practitioner, as well as semi-professional public servants such as nurse, workhouse master and matron, relieving officer, police sergeant, post mistress and bank clerk. Over the whole period, nine students were recorded as studying medicine, veterinary medicine, music, for the civil service, and other unspecified subjects, at Cambridge, Oxford, Edinburgh, Dublin and elsewhere. A few paupers were present in most townships until 1871, provided with charitable support by the Parish Vestry, although some may have been transferred to the Caton Gilbert Union Workhouse. However, in a belated response to the new Poor Law of 1834, the local townships joined with 16 other parishes to form the Lunesdale Poor Law Union which constructed the Workhouse at Farleton in 1872-74 (closed 1935). In 1881, there were 36 inmates, three-quarters being impoverished paupers, mainly retired agricultural workers but also mill workers and domestic servants, one with her family of four children. However, a quarter were mentally retarded (imbecile, idiot, lunatic) and one was blind. By 1901 the numbers had declined to 19. The institution was managed by a Board of Guardians comprising members from all the parishes, which met in Hornby. On a daily basis it was run by the Master and Matron (with a cook) at the Workhouse, and a Registrar and Relieving Officer living at Hornby (1881-1901). He made out the cases for relief and dispensed it. In 1871, William Wolfenden of Lowgill, Tatham was recorded as a collector (overseer in 1910), presumably of the poor rates. After the workhouse opened, there were no records of paupers in other townships, apparently indicating that there were none receiving outdoor relief. For the period from 1841-1901 (2001 in part), information in the censuses reveals how the structure of household units and the basis for their economic support responded to the same pressures that resulted in gross population changes. Firstly, this included the decline of local cottage industries and even a small factory, flourishing in the early Industrial Revolution but adversely affected by competition aided by railway development. Secondly, there was an increase in efficiency in agriculture, reflected by a 25 % reduction of workers. Thirdly, the importance of the incoming of major land owners, which brought in the profits of industry for spending locally. Somewhat comparable to the last was the latest development whereby significant government investment in the larger region provided employment for incoming professionals and others. 1 Baines, E. 1825: History, directory and gazeteer of the County Palatine of Lancaster. II, Wm Wales & Co, Liverpool. 2 Goth, M. 2004-5: The Mill at Wray (Back-o'-the Beck). Contrebis 29, 52-62. 3 Brandon, A. & others 1998: Geology of the country around Lancaster. British Geological Survey, London, 181 pp. 4 Hudson, P. 1998: Coal Mining in Lunesdale. Hudson Historyof Settle, Settle, 393 pp. 5 Kenyon, D. 2008: Wray and District Remembered. David Kenyon, Wray, 238 pp. 6 Kelly, M. 2008: Geology of the Lune and upper Ribblesdale coalfields. British Mining, 85, 83 pp. 8 Goth, M. 2004-5: The Mill at Mill Houses, Wray (sic!). Contrebis 28, 20-22. 9 Humphries M. (Wilson, J. (ed)) 2003: Quarries, Coal, Clay and Cloth: Nineteenth Century Industry in the Wenning and Greta Valleys. Hudson History, Settle, 72 pp. 10 Hudson, P. 2000: Take a closer look at Wenningdale Mills. Hudson History of Settle, Settle, 25 pp. 11 Winstanley, M. (ed) 2000: Rural Industries of the Lune Valley. Centre for North-West Regional Studies, University of Lancaster, 147 pp. 12 Bulmer, J. 1913: History, topography and directory of Lancaster & District. T. Snape & Co, Preston.